How much did you used to love Schoolhouse Rock?! "I'm just a bill..." Ah, nostalgia. So anyways, my commissioned quilt using some American Jane fabric at the request of the client. And if you've been reading for the past month or so, you've heard all the talk complaining about the process. Well I'm done! Finally! Hallelujah! Kitty: Oh look, a new toy just for me. 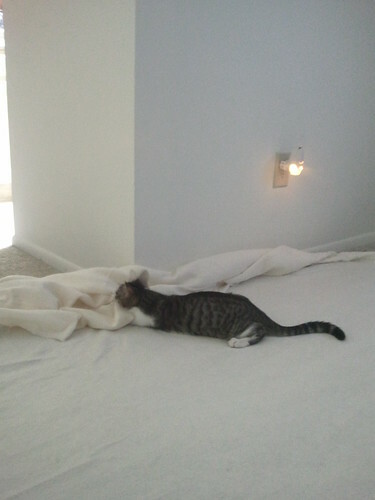 Kitty: I can help, promise. Watch me smooth down this batting. I took these pictures in between work and dropping the quilt off with the client. So I was in a bit of a rush. This is getting marked as my least-favorite finish ever I think. After finishing the top I just felt creatively drained. I wasn't having fun making this, but I had to do it. I actually like the back. I added in my absolute last scraps of the American Jane fabric [seriously Rebecca, why did you only buy 1/2 yd when it was super on sale?] and pieced it so that it didn't just look like I added a strip of the blue Oval Elements onto the side because the green wasn't wide enough. Which is the truth. But still. That's where the effort stopped on this quilt though. 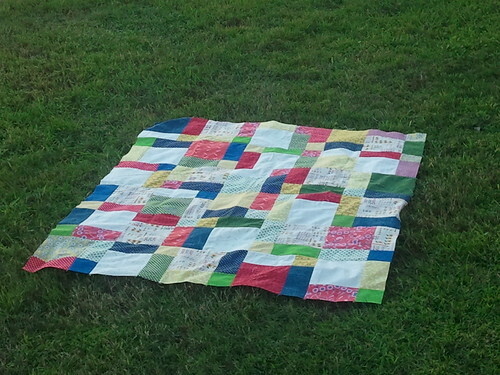 I wish I had done more quilting than the straight lines that you can see here. There was potential for some great quilting, but I was over it, and didn't want to have to sit on the quilt top for even another day. I wanted it done. 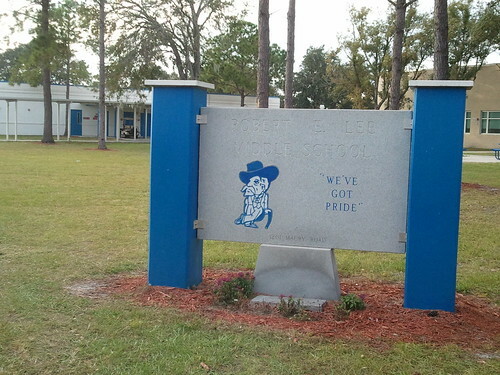 Yep, that's a bobble-head-esque Robert E. Lee up there. 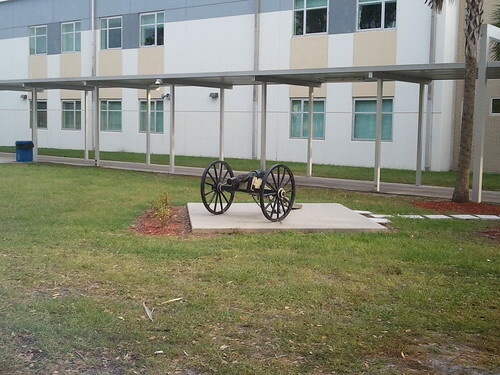 And a cannon. In the courtyard. Only in the South. This is actually where the pictures above were taken, not that you can really tell. I was originally going to take pictures in the gardens at my work [and I still plan to do that with my next quilt] but Thursday was so wild that I didn't even make it to my office. So these are taken at a middle school that I volunteer at Thursday afternoons. 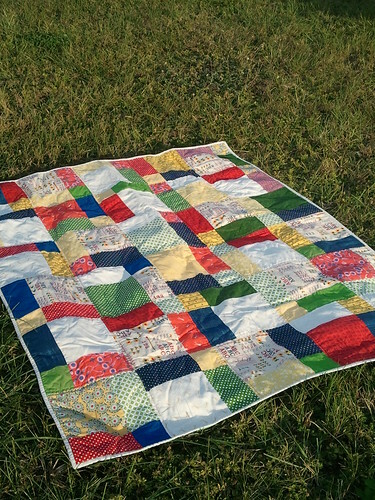 I was tickled that this quilt was made for a teacher for her reading corner and has ABC fabric in it, and the pictures are at a school. No? Not you? Well, it's the little things in life. 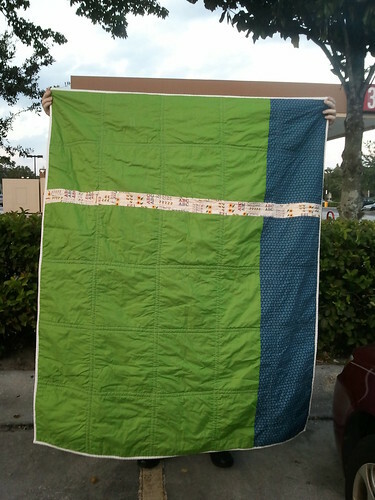 Do you make your significant other hold quilts up in parking lots at very busy intersections so you can get a straight-on shot of your quilt? Because I do. Do you make him leave his dinner so that you get the pictures in the last few minutes before it gets dark? Because I do that too. That's true love, my friends. 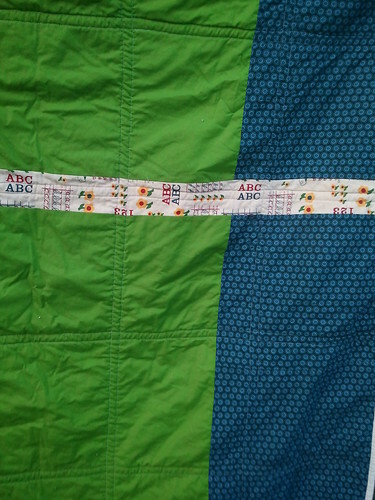 How many pieces of American Jane fabric had to be pieced together to create a long enough strip to go the width of the quilt? I certainly don't know. But I do know that some of the pieces were only 2 inches wide, but they were all that I had left to use! 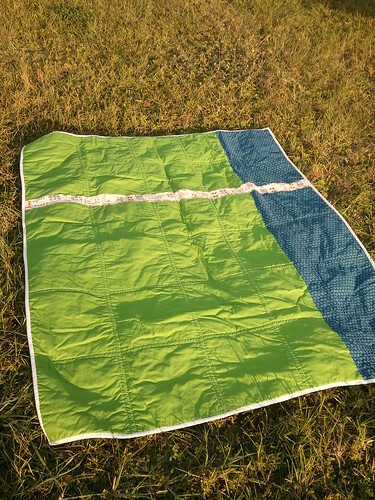 While there were no problems with puckering on the back of the quilt, I know that I didn't baste this very well because I had some drag on the front that resulted in little "puffs" near the intersections of all 4 lines. 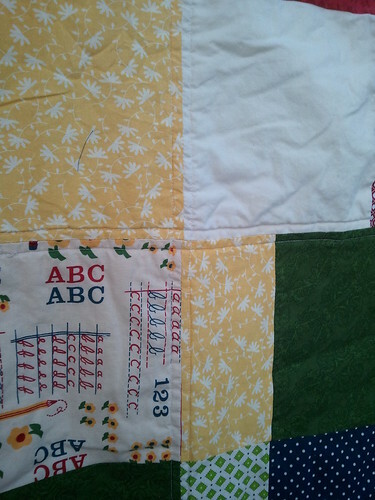 I think my goal for 2013 is to become a perfect quilt baster. *Linked at Finish it Up Friday! It came out great! I love what you did for the backing too! I know how you feel though, about being somewhat uninspired - that happens for me with commissions sometimes too :( The most important part is that the customer loves it. I came over from Finish it Up Friday--I love this quilt! I loooove me some American Jane. You will come back and look at these pictures and love this one again sometime soon. I always hate quilts I've struggled with, and then love them again eventually. That's a great feeling to have it done and delivered. But it's really cute, so you should be proud! I get those puckers to at the intersections, one thing I've done is spray basting with a water soluble spray , and lessening the tension on your pressure foot for the quilting. That needs a bit of practice on scrap pieces, you don't want it too loose, or the bobbin thread will look funny. But it really helps me avoid the puckers! I think there is a YouTube video out there about the topic, you should look it up! Wow it's good to see you got it finished and never have to worry about it again! It's a fun pattern to show off the fabrics. Great quilt. Fun to see all the great pictures! I know it wasn't your favorite, but with your re-worked colors, I think it came out ok! And as long as they like it, you're golden. Have fun working on your own stuff now! After all your annoyance with this quilt, it did come out pretty nice. It kind of reminds me of something my grandma would have sewn in the 90's... I guess that makes it retro?